Casa La Eliana, Salento, Kolumbia : Rezerwuj teraz! Casa La Eliana offers great and affordable accommodation in Salento, have a restaurant serving British Indian Curries and great pizzas, bar and free fast fibre optics WiFi, Rooms come with a private or shared bathroom; as well we provide a 4 beds dormitory with a great shower, and two three rooms apartments with shared bathroom and full equipped kitchen. The apartments are located two blocks from the hostel. Guests can enjoy a garden view and mountain view from some rooms or the balcony. An electric kettle is included and free coffee and herbal teas. This hostel offers a terrace and a garden with hammocks and seating areas. There are also 2 shared living areas. Casa La Eliana is located at the entrance of Salento, 20 metres from the fire brigade, two blocks to the bus terminal, and four blocks to the main square. 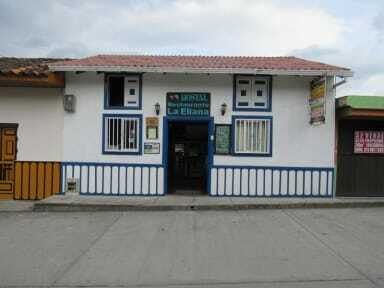 In the heart of the coffee region, we are located at five minutes walking from the main square. Close to the bus terminal and in a quite area of Salento. One of the most popular tourist destinations in the area. 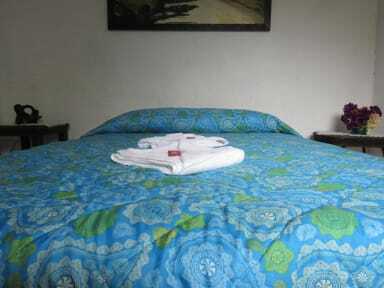 We provide 3 rooms with a private bathroom, two at garden level 5 rooms with shared bathrooms and a 4 bed mixed dormitory. An external apartment with 3 rooms and shared kitchen and bathroom. Check in from 12:00 to 17:00 . Breakfast not included - from 6000 to 10000 COP per person per day.